Joie Harrison swears she really loves doing this. I am a fair weather athlete. The longer days and returning sunshine have dramatically improved my attitude about training. Even on rainy days I keep my shorts and running shoes close by, ready to put in a few miles during a cloud break. I registered for a half marathon at the end of September, so I'm falling back into the familiar rhythm of consulting my running schedule, planning my cross-training and rest days, and smelling at least mildly of mildew most of the time. As I experience motivation spring forward like daylight's savings time, it's gotten me thinking about the more consistently dedicated athletes in our midst. 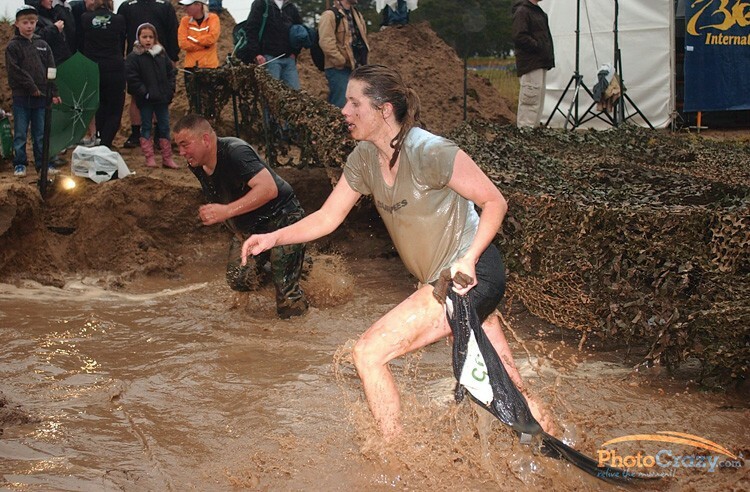 Eureka native Joie Harrison has spent months preparing for the Spartan Death Race, which was held earlier this month. The Death Race is brutal; organizers call it one of the most challenging endurance races in the world. It takes place in the woods of Vermont on a 40-mile course with grueling physical and mental obstacles. The exact nature of the challenges and the length of the race itself (anywhere from 24 to 48 hours) is kept secret from competitors. They just have to keep going. Not surprisingly, no more than 20 percent of competitors finish the course. Harrison describes herself as a "fitness addict," and her training program is intense. She runs, cycles, and participates in "boot camp" style workouts. Recently, she completed an all-night session with a former Death Race champion. She carried a 30 pound sand bag, an 8 pound sledgehammer, and a hydration pack over steep terrain, stopping to chop wood, lift rocks and crawl through mud. In the dark. For real. Joie describes this kind of training as "amazing and challenging." In 2004, Harrison was involved in a fatal car accident that killed her 6-year old daughter and critically injured her and her son. Three years of extensive physical rehabilitation followed. Since regaining her health, she says, "I have been wanting to live life to the fullest and enjoy every moment of it. I love the challenges that the Death Race has, and it appeals to me." When facing those challenges, Harrison finds that training with supportive friends is key, whether they are smiling at her, encouraging her to take short walking breaks on her runs, or promising her, "one more mile" -- when really there are 10 miles to go. When she is alone with her thoughts, Harrison's mantra "Life is Beautiful" keeps her motivated, and running helps her see that beauty. "Running allows me to be free from the rest of the world and at peace. I stay focused on the next three or five feet in front of me and try not to think about that distance ahead." Cathy and Mark Larripa live and train in Manila. They began competing in the Tough Mudder in 2010. Tough Mudder events are 10- to 12-mile obstacle courses that describe themselves as "probably the toughest event on the planet." Are you noticing a theme here? Cathy and Mark's first Tough Mudder celebrated their 35th wedding anniversary. Mark says he "whined and heel-dragged right up to the start of the first Tough Mudder. I ended up enjoying it, as the distance and challenges were offset by the surrounding beauty, Cathy's companionship and the ‘Can do, can I help you?' attitude of the other participants. I'm sure the altitude-induced oxygen deprivation was a factor, too. " The Larripas say being outdoors is a key motivation in their training. Cathy says, "We are fortunate in having a garage-gym and the dunes and beach right out our door. Humboldt County is home to trails for running and hiking, lagoons and the bay for kayaking, and no end of rugged beauty. Motivation quickly returns when I step outside." Like Harrison, Cathy finds serenity in pushing her limits. She says, "I have found that I can more easily access the stillness I yearn for when I'm physically knocked down a couple of notches. No doubt, this is why I gravitate to mud runs, adventure races and long, long hikes rather than seeking out a quiet cave." Mark adds, training "allows you to work out problems or situations you might be dealing with by not looking directly at them." Cathy wears a leather bracelet that has "Defy Gravity" engraved on it. "The words apply whether I am doing an arm balance in yoga, lifting a heavy weight or hill running. When I think of defying gravity, I immediately feel light and unburdened. Not to mention, the rebel inside that gets some satisfaction at least attempting to defy a ‘law,' even if it's a law of classical mechanics." Endurance athletes may perform incredible feats, but they are also indelibly human. Cathy's motivation to train waxes and wanes. Mark enjoys testing himself, and he also does "a lot of whining -- for some reason that helps me ‘git 'er done.'" For many, exercising is a means to an end. We run to lose weight or lower our cholesterol. We cycle to meet goals of time or distance. We lift weights for bragging rights or personal records. Then there are athletes who are able to find joy in the means themselves. They are able to take pleasure in physical hardship and get excited about the consistent push of training. By turning the work into play, they are able to push themselves to the limits of athletic endurance. It's not genetics, and it's not rocket science. As Mark says, it's just "one step at a time. The end always shows up."